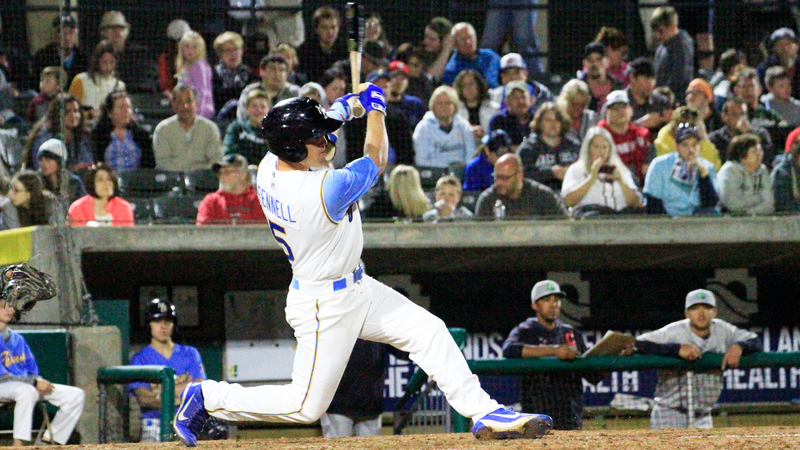 MYRTLE BEACH, S.C. (April 4, 2019) - The Lynchburg Hillcats exploded for 14 runs on 17 hits as the Myrtle Beach Pelicans fell 14-5 in the 2019 season opener on Thursday night in front of a sellout crowd of 6,599 at TicketReturn.Com FIeld at Pelicans Ballpark. Alex Lange , a returner from 2018, received the Opening Night start for the Pelicans and cruised through the first inning, striking out a batter and retiring the side in order. The second inning is where the trouble began for Lange, as a leadoff triple by Oscar Gonzalez set the tone for a big inning. A groundout by Trenton Brooks brought Gonzalez home from first to stake the Hillcats to a 1-0 lead. A Pelicans' (0-1) error kept the inning alive for Lynchburg (1-0) as Gavin Collins reached first and Dillon Persinger followed with a single to put two men on and just one out. After a walk and a strikeout, Steven Kwan delivered a bases-loaded single that drove home two runs to extend the Lynchburg lead to 3-0. Nolan Jones and Gonzalez kept the offense coming for Lynchburg in the third inning with back-to-back base hits to lead things off. Brooks gathered his second RBI of the night when he pushed Jones across after a ground out to first. Persinger then singled to plate Gonzalez, which pushed the Hillcats lead to 5-0. Kwan added another run in the fourth inning for the Hillcats after he singled to lead off the inning and came home to score on a Gonzalez ground out to make it 6-0 Lynchburg. After scoring two more runs in the sixth inning, the Hillcats led 8-0 heading into the bottom of the sixth. Lynchburg's starter, Justin Garza (1-0), was dominant tonight as he spun five innings of no-hit baseball with four strikeouts to secure his first win of the season. After Garza's exit after the fifth inning, the Pelicans found a groove offensively in the bottom of the sixth. Jhonny Bethencourt reached on an error to open up the inning and D.J. Wilson followed that up with a bunt base hit to break up the no-hitter. Miguel Amaya then drove them both in on an opposite-field double to right, picking up his first RBIs of the year and cutting the Lynchburg lead to 8-2. Later in the inning, Kevonte Mitchell dropped a single into left-center an Amaya came home to close the gap to 8-3. After a quiet seventh inning, Lynchburg tacked on two more runs in the eighth inning. Jones doubled to plate Jodd Carter and scored on a single from Gonzalez to make it 10-3. Myrtle Beach responded with two runs in the bottom half of the inning as Wilson scored on a wild pitch and Luke Reynolds picked up his first RBI of the season on a single that scored Jimmy Herron to make it a 10-5 game. The Hillcats took away all doubt in the top of the ninth inning by scoring four more runs, including homers by Brooks and Luke Wakamatsu. With the 14-5 loss, The Pelicans drop the first game of the season for just the second time as an affiliate of the Chicago Cubs. Myrtle Beach will meet with Lynchburg for game two of the series on Friday night at 7:05 p.m. Bryan Hudson (0-0, 0.00) will match up against Adam Scott (0-0, 0.00) on the mound in a battle of left-handed pitchers. Friday will be a Fish Fry Friday with fish fry dinner plates and $2 craft drafts available from 6-8 p.m. It will also be a First Responders Friday, where any first responders can show their ID at the Anderson Brothers bank box office to recieve half-off their ticket, courtesy of 707 Shooting Range, Allegiant Air, WMBF and Mix 97.7. Also on Friday, bring your dog to the ballpark as the Pelicans host their first Bark-in-the-Park of 2019. Dogs are admitted free with the purchase of a Budweiser Thirst Inning Deck ticket.